Four Bangladeshi bloggers are facing up to seven years in jail after they were charged in court Sunday with defaming Islam and the Prophet Mohammed, a prosecutor told AFP. The four men, who deny the charges, were arrested earlier this year in the wake of nationwide protests in which Islamic groups demanded the execution of atheist online commentators. Judge Zahirul Haque, sitting in a court in the capital Dhaka, said the bloggers were being charged under the country’s Internet laws, senior public prosecutor Shah Alam Talukdar told AFP. “They have been indicted... with defaming Islam, the Prophet Mohammed and other religions through their Internet writings. They spread malice against all religions,” he said. 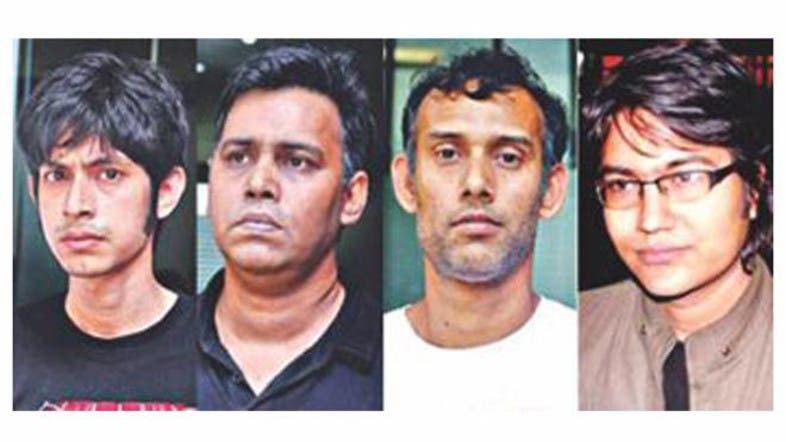 Talukdar said if found guilty the bloggers, who are free on bail, could be sentenced to seven years in jail under the country’s ICT (Information Communication Technology) laws. “All four have claimed to be atheists,” he added. That came amid massive rallies in the capital in which secular groups demanded the hanging of leading Islamists accused of war crimes during the 1971 war of liberation. Islamist groups have since staged nationwide demonstrations, with their demands including the prosecution -- and execution -- of atheist bloggers. In May, at least 38 people were killed as police broke up a protest by thousands of religious hardliners in some of the country’s fiercest street violence for decades. Rights groups have called on the government to drop the charges against the bloggers, saying the men are caught in the battle between Islamists and the secular government. The government has said it is determined to ensure communal harmony in the deeply conservative country where 90 percent people are Muslims. Five students of an elite university have been arrested in connection with the February blogger murder, while a little known Islamic group has been blamed for masterminding the crime.